Former Foreign Minister Gareth Evans once said, “No two neighbours anywhere in the world are as comprehensively unalike as Australia and Indonesia.” Despite proximity, Canberra and Jakarta may as well be worlds apart but changes need to be made if the countries want to face the future in a strategic way. Change is happening on all fronts. In the realm of geopolitics, new institutions are emerging. An alphabet soup of new financial institutions reflect new power rivalries. These include the Asian Infrastructure Investment Bank (AIIB), trade blocs like the Comprehensive and Progressive Agreement for Trans-Pacific Partnership (CPTPP) and the Regional Comprehensive Economic Partnership (RCEP), and security conferences and groupings like the East Asia Summit (EAS) and the so-called Quad. Technology brings benefits but also sharpens the impact of change. The International Labor Organization estimates that 56 per cent of jobs in Cambodia, Indonesia, Thailand, the Philippines and Vietnam are at risk of replacement by automation over the next 20 years. The Edelman Trust Barometer shows significant changes in how institutions are perceived in countries like Indonesia and Australia over the past three years. 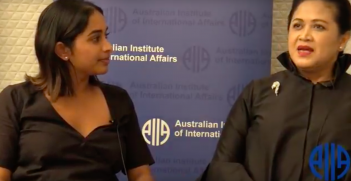 Managing and responding to change emerged as a common theme throughout the discussions at the 4th Indonesia-Australia Dialogue, hosted in Sydney by the Australian Institute of International Affairs this month. The dialogue was convened to examine Australia-Indonesia relations in a ‘track two’ setting and participants representing both countries discussed the different dimensions of the relationship in four areas: the global and regional context; progress towards a comprehensive strategic partnership; innovation and the creative economy; and a combined session on media, youth, society and culture. Although Australia and Indonesia share values like democracy and a geographically strategic position in the Indo-Pacific region, change is affecting their societies in very different ways. In the Edelman survey, Indonesia reported higher levels of trust in government, media and business compared to Australia, which ranked among the most distrustful of these institutions. Participants in the dialogue noted that religion in Indonesia is becoming more important, meanwhile Australian society continues along a secular trajectory similar to other Western countries. These differences could pose challenges for bilateral relations. However, when considering the bigger picture of global and regional issues, it becomes clear that Australia and Indonesia have overlapping interests. Australia and Indonesia have worked together to achieve historic results in the past. Their cooperation on the resolution of the Cambodia conflict helped bring stability back to mainland Southeast Asia after decades of war. It also helped pave the way for Vietnam (and indeed the rest of Indochina) to join ASEAN. Today, both countries work together on a regional anti-terrorism forum. Between the two, they hold influential positions in every significant regional institution. These examples suggest that despite the divergence of their societies, they hold a shared interest in regional outcomes and cooperation can be incredibly effective. 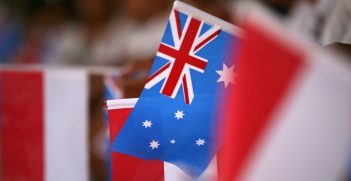 In the current geopolitical landscape, there is an abundance of opportunities for Australia and Indonesia to influence how these changes eventually shape the region. Cooperating in the region also means updating bilateral frameworks and agreements. A question posed after an opening session on global trends was whether or not the 1996 Australian-Indonesian Security Agreement should be renegotiated. Another session examined how Australia and Indonesia should progress towards a “comprehensive strategic partnership” to reflect new realities in the international system. Improving weak business relations is a priority for both governments and an imperative for Australia, which will quickly get left behind in a region of rising economic giants. Australia and Indonesia are currently negotiating a comprehensive economic partnership agreement (IA-CEPA). It is expected that the IA-CEPA will be finalised this year and both governments are promoting the agreement as a way to boost fledgeling bilateral trade and investment. A discussion about the definition and role of the millennial generation in Australia-Indonesia relations dominated a session on youth, media, society and culture. Participants were concerned that not enough has been done to persuade this generation that Indonesia and Australia are important to each other. In Australia, the teaching of Bahasa Indonesia in schools has diminished and Australian participants were concerned about the lack of Indonesian literature and history in school curricula. Visa restrictions in both countries make it complicated for millennials on both sides to get on-the-ground work experience in either country. After all, it’s this generation who will be leading the relationship in the next 20 years. 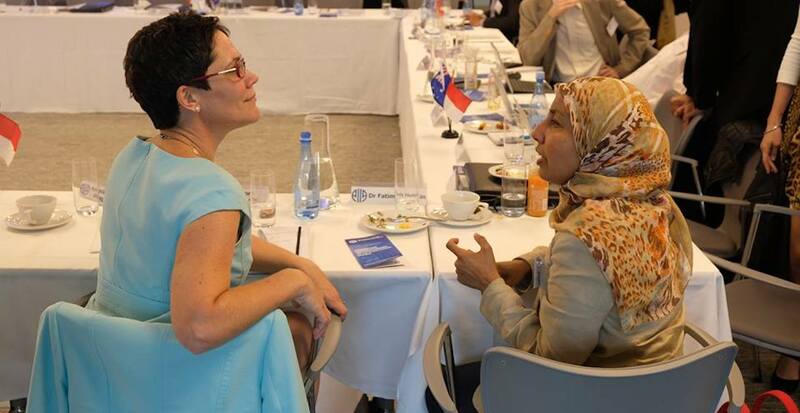 The dialogue, which consisted of a day-and-a-half of discussions, broke up into smaller working groups on the last day with the aim of developing policy recommendations to improve relations. A recommendation concurrently developed by three of the groups sought to break down barriers to entry for young people. Out of those discussions came the recommendation to create a special visa category, reciprocated by both countries in order to allow young Indonesians and Australians to undertake internships and cultural immersion programs. Another recommendation recognised that although millennials get most of their news from mobile apps on their phone, Pew Research in the US found in 2016 that millennials are reading more books than older generations, and still prefer print over e-books. Therefore, translating works of Australian and Indonesian literature and promoting them through major literary festivals was examined as a possible method for improving cross-cultural understanding among millennials. Indeed, a one-and-a-half day dialogue seemed not enough to cover in suitable depth the multitude of topics and possible nodes of cooperation between Indonesia and Australia. This underscores the importance of the bilateral dialogue and its role in identifying where change presents both countries opportunities to make a difference. The recommendations from the dialogue and the current pace of bilateral relations moving towards a comprehensive strategic partnership are all steps in the right direction as both countries grapple with the formidable changes in the international system. Kyle Springer is a program manager at the Perth USAsia Centre at the University of Western Australia. He grew up in Indonesia, Australia and the US. Kyle develops projects focussed on strengthening Australia’s relations with Asia and the US. He attended the 4th Indonesia-Australia Dialogue on 8-10 April organised by the Australian Institute of International Affairs with the support of the Department of Foreign Affairs and Trade, Indonesian Ministry of Foreign Affairs and PwC.